Hi I’m Kristina from Toddler Approved and I am excited to share a favorite book-themed winter art activity with you today. I love Jean’s blog and her posts are constantly inspiring me to be a more creative mom. 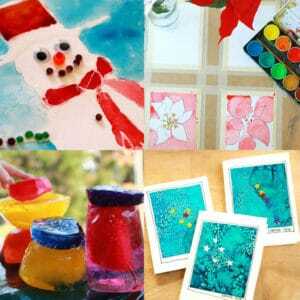 I find as winter begins and we all get a little stir-crazy indoors, I need a gazillion ideas to keep myself (and the kiddos) from getting too bored. I hope this ends up being a fun one you decide to try. I have a toddler and a preschooler and like to come up with art experiences that we can all have together… otherwise the baby is wreaking havoc all over. We love Jan Brett’s book The Mitten, so we decided to create some of our own mittens and then use them to play a game inspired by the book. To create the mittens we used two different painting techniques: crayon resist painting and baggie painting. The baggie painting technique is perfect for little toddlers who might not be too trustworthy with paint yet (mine eats it). 1. Trace your child’s hands several times to make mittens. We made 8 mitten sets since there are 8 animals in The Mitten. 2. Trace over your mittens with a marker (optional) and then cut them out. 3. Cover some of the mittens with crayons and then paint on top of them. 4. Put paint in a ziploc bag and put some of the paper mittens inside. 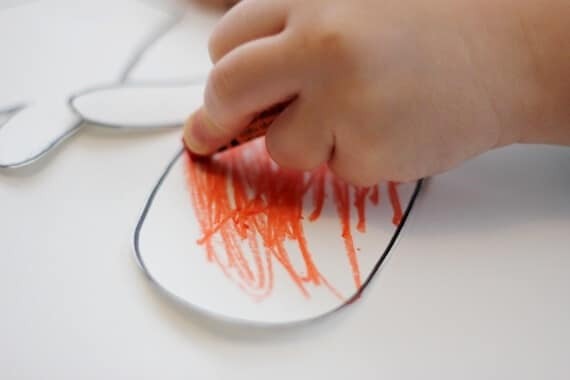 Close the bag and then let your little one move the paint around to cover the mittens. 5. Take the mittens out after a minute of “painting” and let them dry (if you leave them in too long they get too moist and start ripping). 6. Once all the mitten pairs are dry, read Jan Brett’s book The Mitten and write the names of each animal on the back of one pair and glue the picture of the animal on the other pair. 7. Have your little ones hide the mittens all around your house and then work together to try and find them all! 8. Match the pairs as you find them! We loved talking about colors, animal names, letters, and trying to “read” the animal names by looking at the beginning and ending letters. This activity provided hours of fun for us on a rainy day. I’m Kristina, a mom of two (a preschooler and a toddler) and a former Special Education teacher for children with communication disabilities. I write about our creative explorations over at Toddler Approved. I blog alongside one of my best friends and we love sharing ideas with each other and our readers. My main interest is to find ways to make life a little more fun and creative. I also love to embed language learning into everything that we do. Aaah such a lovely set of activities. Beautiful photos too! LOVE it, Kristina … creative and educational! The Mitten is one of my favorite winter books, and it’s great that this works on a number of skills in such a fun way! Thanks for the post! That looks great. I really like book inspired art, and my girls really like Jan Brett. Thanks for letting us share on your beautiful blog Jean! Deb- you are too sweet. I absolutely love this book too and need to find even more things to do with it. That is the coolest idea ever Molly! I was thinking it would be fun to make a big mitten out of felt or something and then stick paper or felt animals in it as they told the story… but your this sounds even better! How fun! What a wonderful idea to incorporate books, language and art! We haven’t read The Mitten, so I’m looking forward to doing this with my little ones. Great post, Kristina! We are huge fans of Jan Brett and this book is one of our favorites. I love the bag painting idea. My boys love to paint, but whatever the project, my 3 yr old usually ends up painting himself and then trying to paint his big brother. I am going to introduce him to bag painting this week! Wow, Molly — big enough for all the kids to climb in together?! Wonder how long that took to knit? Thanks for this post, Kristina! I can’t wait to try painting in a bag with my kiddos. That’s a new one for us. Great book. And great activities! Love this project so much – cannot wait to try it! When I used to teach, we used our body sock as the mitten for the children to all climb in. It was hysterical and they loved it! Hi Kristina. Such a cute idea that involves literacy and art. Why the crayon and paint? You don’t paint it twice right? The bag painting is a cleaner option?